This post contains some affiliate links for your convenience. Click here to read my full disclosure policy. 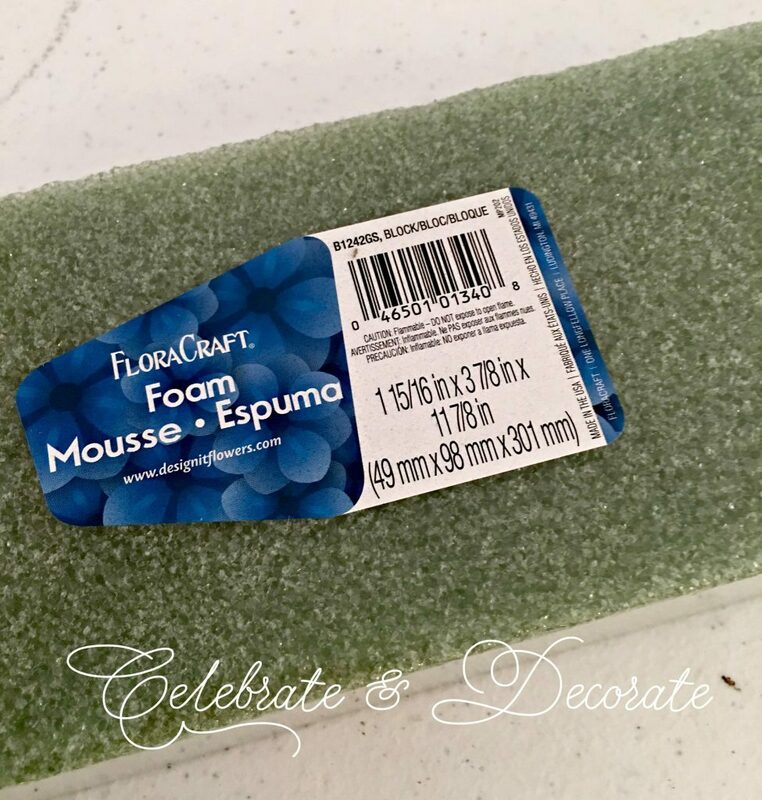 If you click on any of the links and make a purchase, I get paid a small amount so I can continue to share crafts here on Celebrate & Decorate. This does not affect the price of any of the products for you. The last swag I made was a lot of pale pinks for Valentine’s Day. 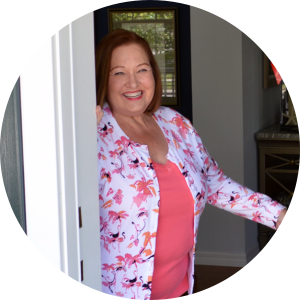 I have enjoyed that one on my front door, but I was ready for a change. 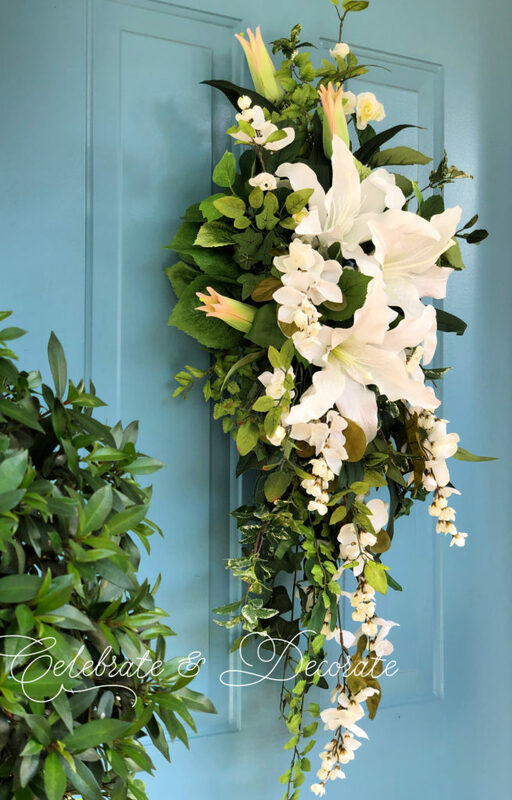 I considered Easter Lilies, but I was thought if I went with some different lilies, I could leave the swag up a little longer. 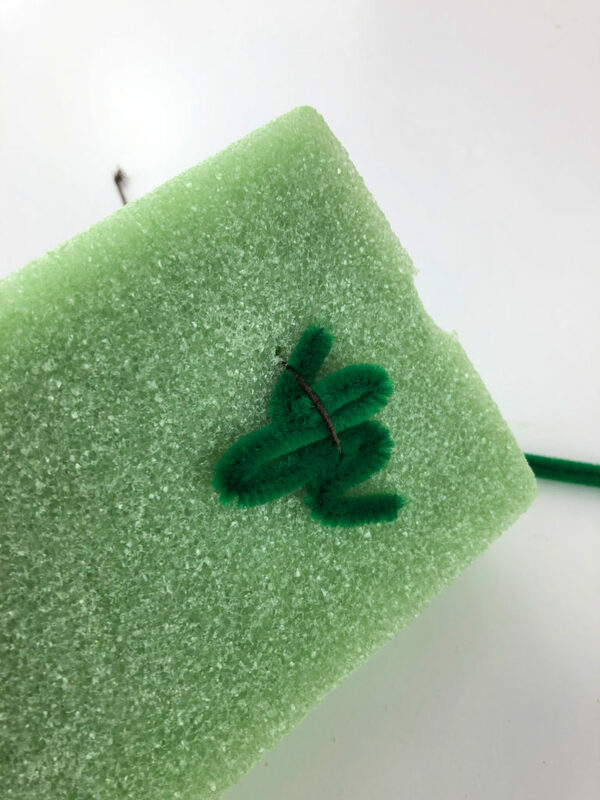 It can be difficult to follow along the step by step adding of the flowers and foliage, so I have included a video for this one! I begin all of my swags with a block of styrofoam. This is a standard size that is about 2 inches by 4 inches by 12 inches. Here is a link for getting your styrofoam blocks! The first step to making your swag is to give yourself a hanger to hang it from the door where you will be displaying it. I like to use a paper wrapped wire. 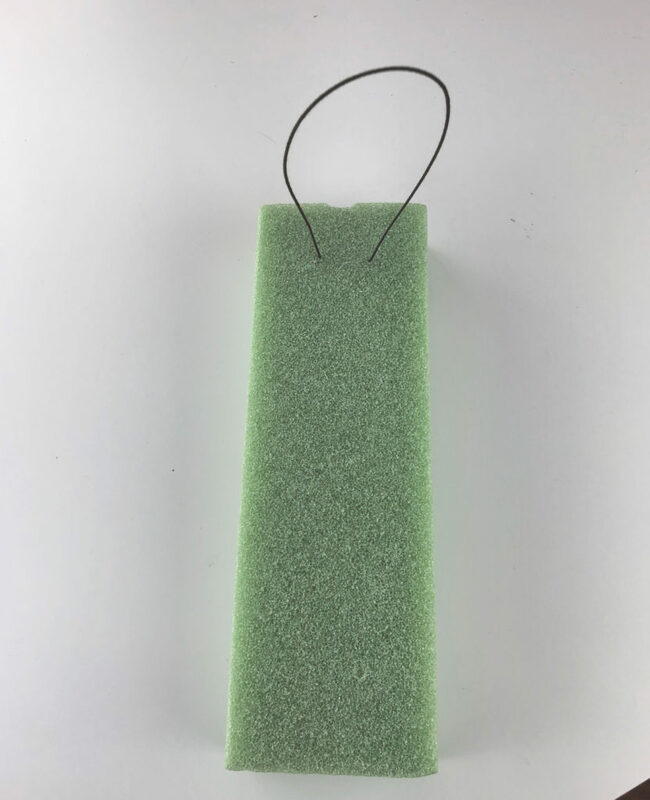 Push both ends of the wire through the foam, but DO NOT pull it all the way down tight agains the foam. If you do, it can cut right through the foam. Cut a pipe cleaner in half with a pair of wire cutters. 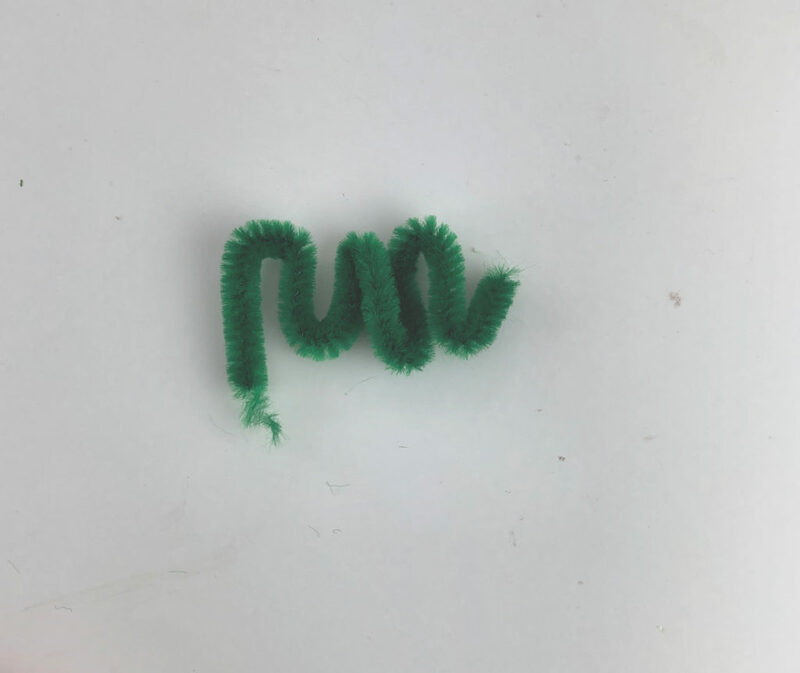 Take each half of the pipe cleaner and bend it as shown, or in and “M” or “W” shape. Take that squiggly piece of pipe cleaner and put it down beneath the wire and then you can pull the wire tight. 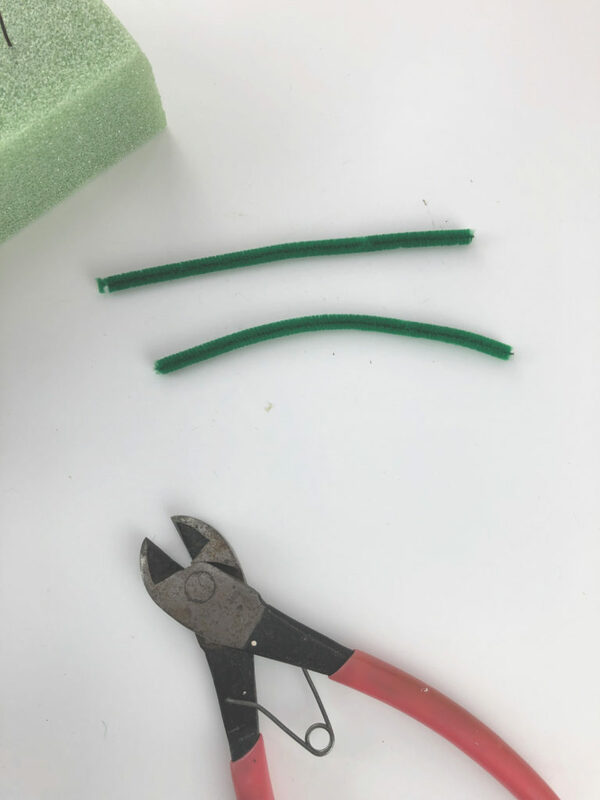 That pipe cleaner will keep the wire from cutting through your foam. 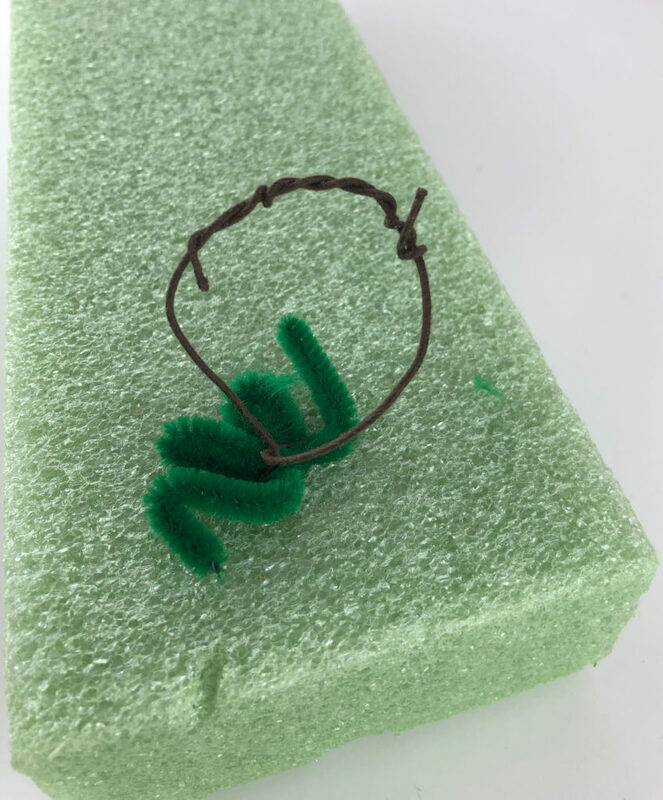 Use the other half of the pipe cleaner on the back of your foam and then twist the ends of the wire and make a circle to hang your swag on a hook on your door. You can make a swag like this without a Steelpix machine, but it sure makes everything easier! The alternative is to use wood wired sticks. 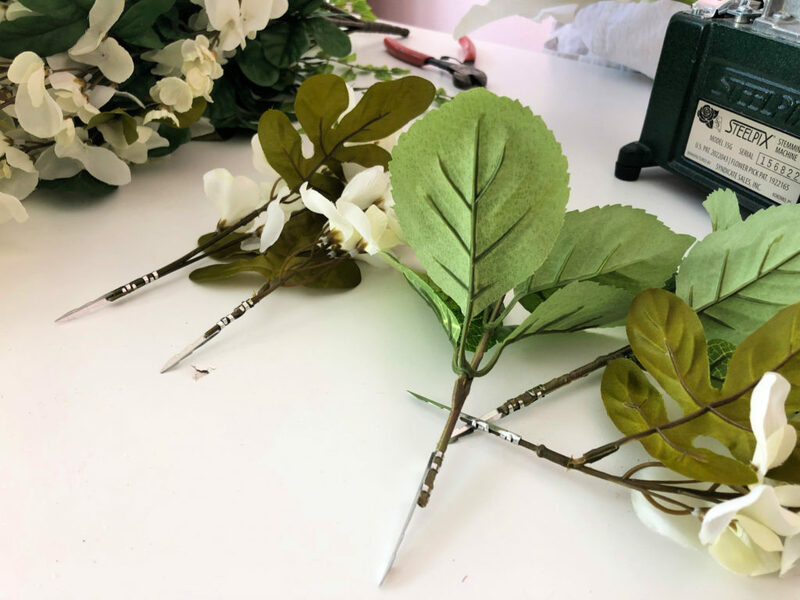 Prepare to begin making your swag by using wire cutters to cut the flowers and greenery you are going to use off of the bushes or stems they come on and then adding a steel pick or a wood wired stick to each piece. Greenery and flowers are ready to use! 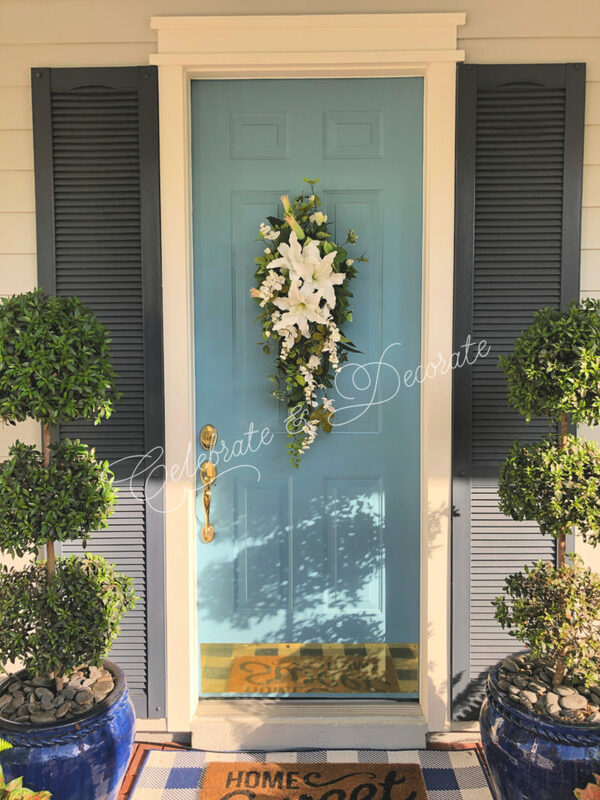 Time to start having fun and designing a beautiful floral swag for your front door! If you would like, you can just follow along on the video below or follow these steps. Begin with a few green leaves. 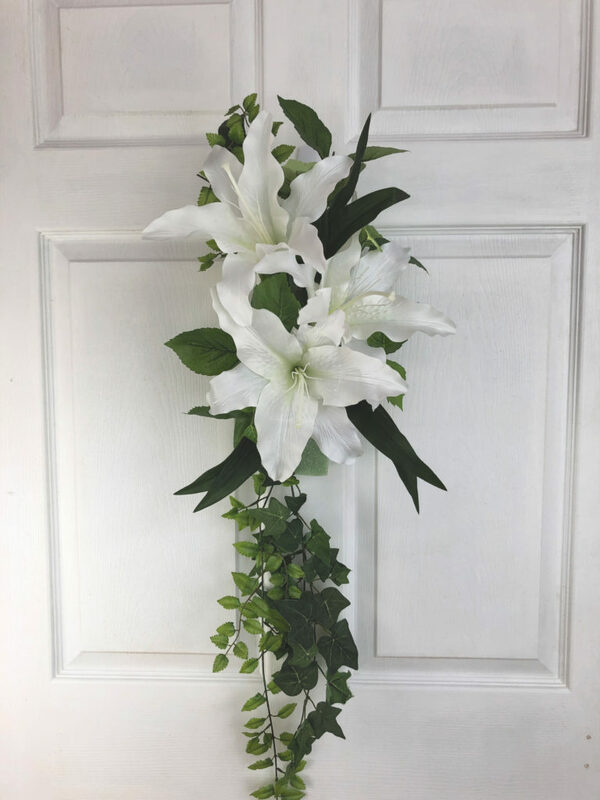 I usually start my swags with more greenery, but I really wanted these three lilies to be the stars of this swag and I didn’t want to waste greenery behind the lilies when it was not going to show at all. 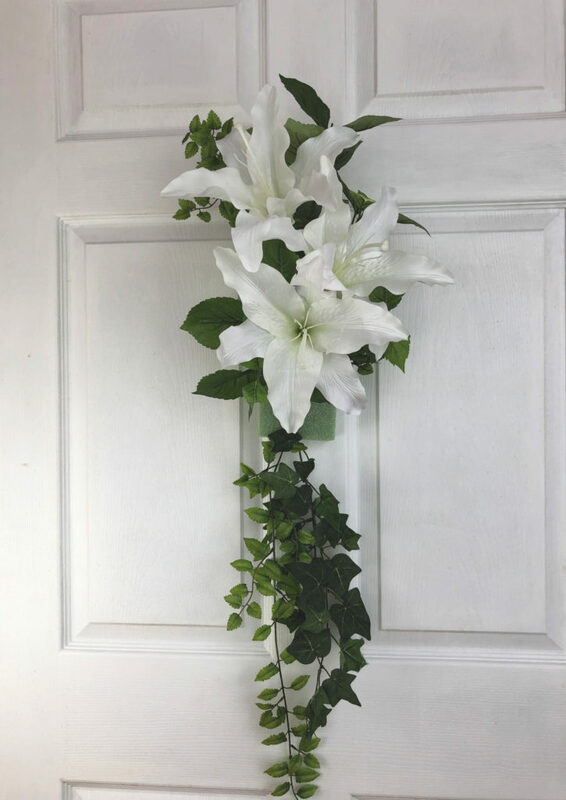 After adding the lilies, I began shaping the swag with longer pieces of greenery to the bottom and some smaller pieces to the top. Don’t overlook any of the foliage from the stems of flowers. For this swag I added lily leaves to coordinate with the lilies used in the swag. Time to add additional flowers! For length I selected white wisteria. You can add as many different flowers and whatever colors you would prefer for your swag. Almost finished! 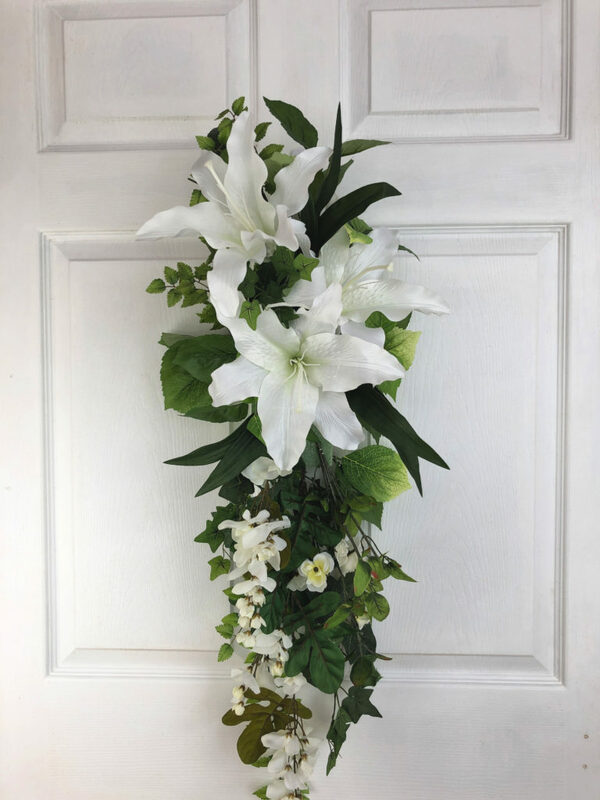 Incorporating more white blooms and some variegated A few more tweaks and the swag is ready to hang on the front door! 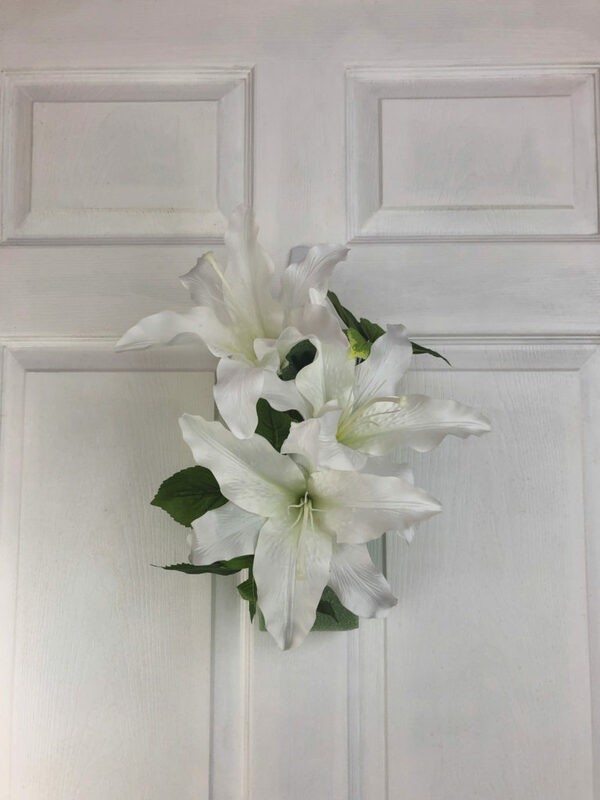 My door is decked for Spring with beautiful white lilies and yours can be too! If you prefer, you can watch the video and follow along! Wow that’s amazing! I love it!! Thank you so much Liz! 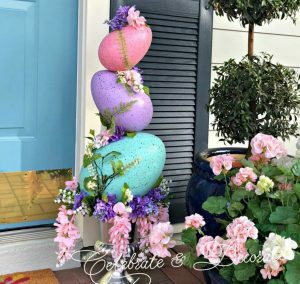 I love changing up what I have on the front door and usually opt for a swag over a wreath. That is stunning Chloe! On your door. Thanks for sharing the tutorial and wishing you a Happy Tuesday! Thank you Pam. I have really been into monochromatic designs lately! Thank you so much Burnette! I really appreciate you taking the time to comment! I love to hear from my readers! Where are you? I am in Celebration! Chloe, I love Celebration! Have been there several time especially love Christmas there!! I am in The Villages. Been here for 11 years. Getting way too big and crowded now. Such a beautiful swag! I love this!! Thank you, Lynne. 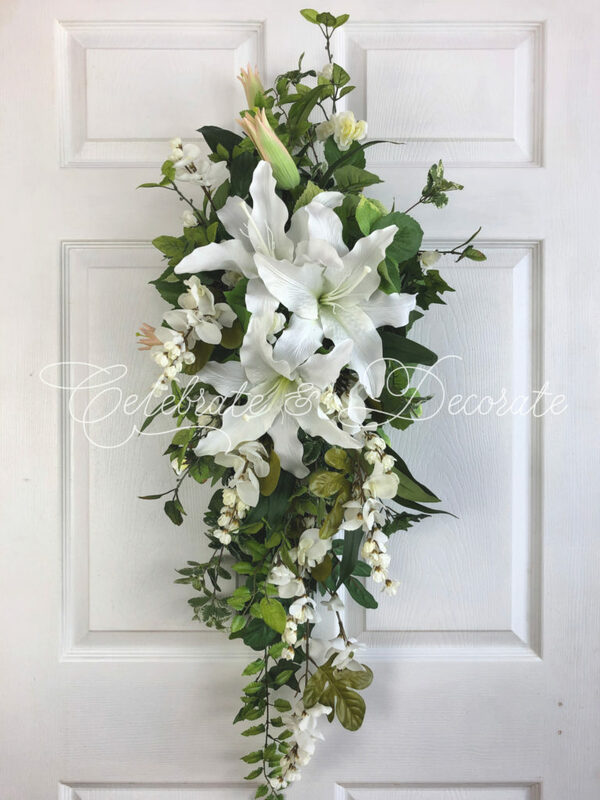 There is something about all white flowers that says dramatic! This is beautiful Chloe! 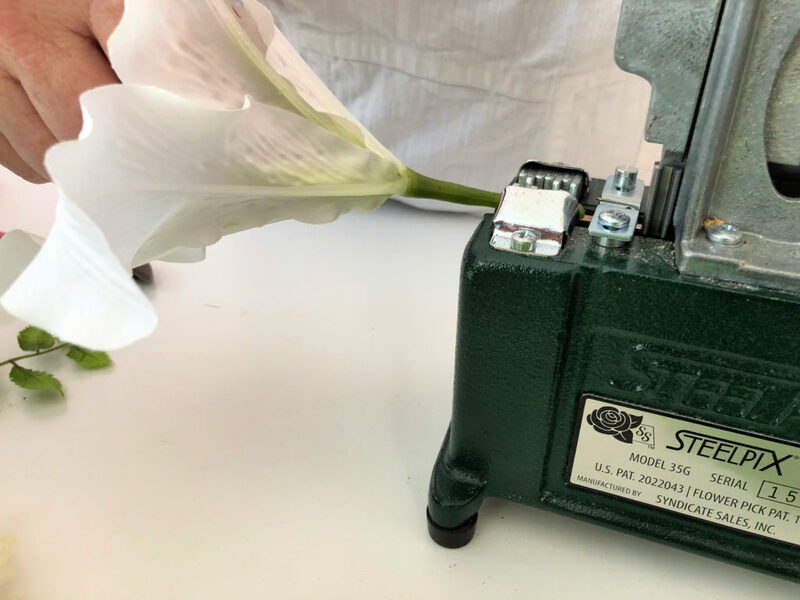 I’ve never heard of a Steelpix machine, wow, that is quite a gadget! Absolutely gorgeous my friend! A swag fit for a Queen! Chloe, that is absolutely gorgeous! You definitely have a gift for making an arrangement! Hugs!! 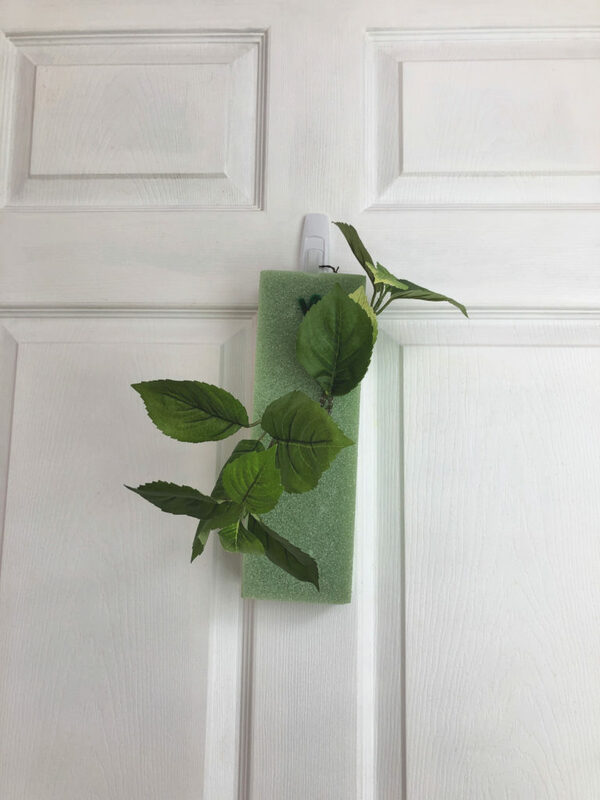 Thank you so much Jean, I am enjoying it on my front door! Chloe, you did an absolutely stunning job on your beautiful swag! I love it. 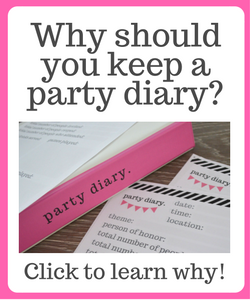 Thank you so much for popping over and sharing with us at Thursday Favorite Things party! I’ll be featuring your Beautiful floral sway tomorrow at our party! Pinned away! Happy weekend wishes to you! Thank you so much Theresa! I really appreciate the feature! HUGS! I might miss the party this week, I am off at a conference! I am inspired! Headed to the craft store today! Oh, I am so glad! 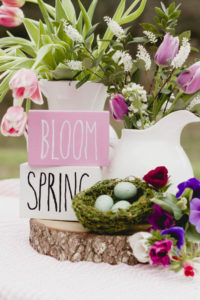 It really is easy to create exactly what you want with the colors and flowers you want for your space! Let me know how it turns out!